The “paranza” is a typical Neapolitan fishing boat provided with a small fishing net, from which originates the recipe name. More precisely, the seafood fry is a fry consists exclusively of small fish such as mullet, the sole, the cod, anchovies and hake. 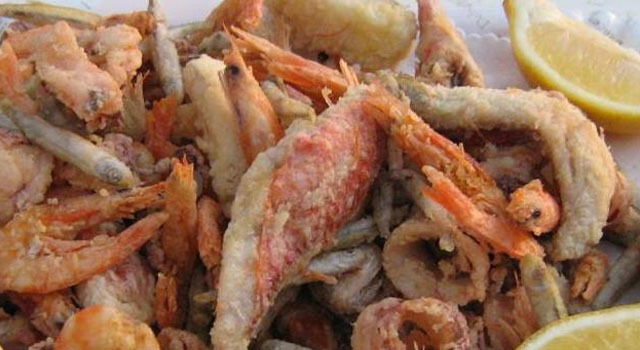 The difference between a fish fry (such as, for example, squid and shrimp) and a frying of fish is that in the latter the minnows first come fried in hot oil, are passed solely and exclusively in the flour, while, in before, the batter is used and for this reason, we can claim that the seafood fry appears to be certainly more light. 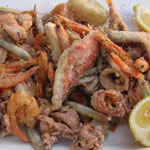 The fish fry can be made ​​using only fish with plugs or by adding squid and shrimp to make it even richer. In both cases, the result will be excellent if you apply some basic rules for cooking and of course if you use fresh fish. Wash and eviscerate fish, flour fish generously and fry in well hot oil. Add salt and pepper, serve with lemon sections.